Most faults you will encounter are from a fairly simple cause. Sometimes these are easy to track down sometimes not. The key to success is to use a logical and systematic approach when trying to pinpoint the cause. A good stating point is to get familiar with your consumer unit whether it is a fuse type or a circuit breaker type. Identify what circuits you have and what they do. You'll probably have several lighting circuits, probably one on each floor and several socket circuits (ring circuits) one on each floor. Additionally you may have several circuits for individual things like cookers, electric showers, alarms, out-door power, etc. In the event of a fault you may find a fuse blows or a circuit breaker trips on one of these circuits. Clearly the problem is limited to that one circuit. You can try to reset the breaker or change the fuse. This may well solve the problem if it has been caused by a temporary overload. 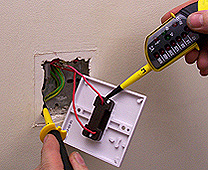 If the fuse blows again or the breaker trips you still have a fault and need to investigate that circuit. Or, there is a short circuit which means somewhere you have a live wire touching something it shouldn't, which will be due to one of several possible causes. Lighting circuits which won't reset. A common fault is a short circuit on the bulb holder which can get damaged by heat which also makes the cable brittle and then the insulation fails. 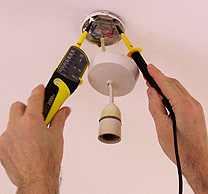 You'll need to replace the bulb holder and the cable if its scorched or the cable is brittle. 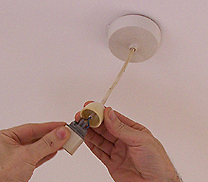 You could also unscrew the plastic ceiling rose to to check for any signs of corrosion on the wires possibly as a result of some dampness. 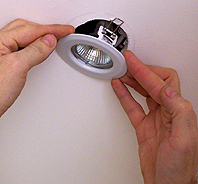 A common light fitting nowadays are low voltage down lighters. The fittings attach into a round hole in the ceiling using a spring clip. Inside you find a connection block and small transformer connecting to the lighting circuit. These lights tend to generate a lot of heat. I regularly find evidence of heat damage on the cable and sometimes the transformer. If so they'll need to be replaced. Make sure these fittings have a good air gap in the ceiling void. Remove any insulation that is close by. 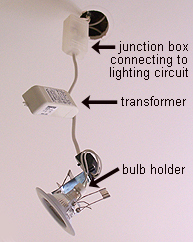 NB if you do replace a transformer (approx.£7) make sure you wire the mains wire to the mains and the low voltage wire to the bulb holder fitting. They will be marked. All the relevant parts unscrew. Make sure you turn the power off first. Socket circuits are normally very reliable. If they won't reset you may be overloading the circuit with too many appliances plugged in. Try unplugging the appliances. Otherwise call a qualified electrician. Other faults which aren't causing the fuse to blow or breaker to trip. 2 Are you getting power to the ceiling rose? Yes? Then it's probably a faulty bulb fitting which needs replacing. If you do change it change the cable to as this can get brittle with age. (depending on how bad it is this may or may not be blowing a fuse or tripping the breaker) Be very careful when testing live wires. For 2 and 3 above you'll need to use a voltage or mains tester(see my section on voltage/continuity checker) Be very careful you will be testing live wires. 4 Low voltage down lighters have a quite delicate bulb fittings. These wear quite regularly and need replacing (approx. £2). 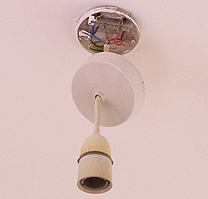 A tell tail sign that these fittings are failing is if you look at the bulb and see that one or both of the contacts are discoloured brown or black. If they aren't both nice and shiny replace the fitting. 5 Fittings with screw in (ES) bulbs. This type of fitting can fail simply due to poor contacts that the bulb screws onto. The two contacts are generally brass and slightly springy. They can oxidise and so cause a bad contact or get forced back by the bulb and lose a bit of their spring. With a small screwdriver try scraping off the any corrosion and gently adjust the contacts up and out a mm. or two so bulb forms a better contact. Electric socket not working? Does the appliance you are trying work in another socket on the same socket circuit? If so then it's probably a faulty socket. Try replacing it. (see replacing a socket). 3 If other appliances works on the socket and you've checked the fuse then the appliance is broken! Replace it or try and get it repaired by a specialist. If you have garden/ outside lighting it should have been installed with outdoor grade fittings which are rain or water proof. Even if this is the case some times they do corrode and stop working. Often this causes a short circuit and will continually blow the circuit fuse or trip the breaker. It will need replacing to enable you to reset. This will trip if there is corrosion to cables or a little dampness in the fittings and connections.